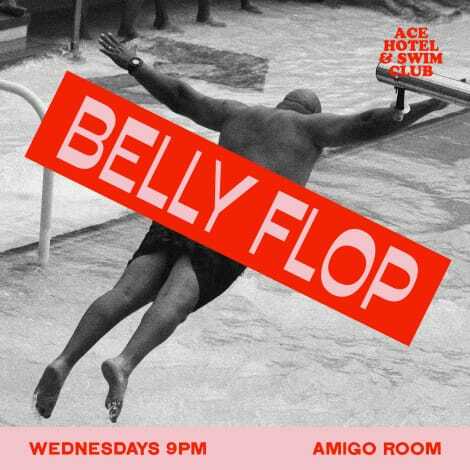 Most Wednesdays, laugh out loud at Belly Flop — our weekly stand-up series. Tonight, Neil Hamburger makes us laugh. America’s Funnyman Neil Hamburger is the hardest working comedian in existence, performing up to 399 shows a year internationally to critical acclaim and audience bewilderment. He has toured as the hand-picked opener for Tenacious D, Tim & Eric, and Faith No More, appeared on TVshows ranging from Tim and Eric Awesome Show GreatJob! to JimmyKimmel Live!, and worked extensively with Tom Green on his internet talk show. Among his dozen or so albums and DVDs is the new LP release Hot February Night. The Canadian Romantic is a melodramatic figure of faded glamour who tries to bridge and explore the gap between Canada and romance with somewhat dubious results. The Canadian Romantic exists via live performance (having performed across Canada and The United States), a video series, a pen-and-ink art book, a yet to be released long playing album with Chris Cummings (Marker Starling), a doll, and even a winking photo. You will come alive with laughter feeling like you’ve woken up at an undisclosed time with makeup smeared across your face. Lizzy Cooperman was named one of Time Out LA’s Comics to Watch in 2018 and has appeared on HBO, Comedy Central and in the new Lord Huron video for Vide Noir. She’s performed at festivals including Montreal’s Just for Laughs, Bentzen Ball, Red Clay Comedy Festival, and Bridgetown, and has written for several shows including The Eric Andre Show, Not Safe with Nikki Glaser, The Soup, The Dish, and a show that only aired in the Ukraine and Germany called Naked and Funny.